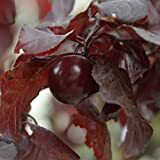 25+ Seeds of Prunus cerasifera - Cherry Plum/Myrobalan Plum Tree. Rare hard to find purple delicious plums! Growing information: perennial plant, growing hardiness zone: 5-10, water needed – average to big amount, light conditions – full sun to partial shade, height: 3-14m, 10-45 feet. Fruit harvesting from spring to summer and better to protect the fruits from pests. Cherry plum trees for sale – What need to know before buying Cherry plum trees? Except the taste need to check: trunk without no holes, pests and disease free, the soil clean from ants nest or other insect, need to check leaves that there isn’t distortion sometime it can indicate of disease.